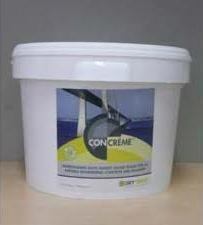 Dry Treat Concreme is a specialist civil engineering product - the ultimate sealing technology for the protection of engineering concrete and masonry from damage caused by water and water borne salts. Dry Treat CONCRÈME™ is a specialist civil engineering product - the ultimate sealing technology for the protection of engineering concrete and masonry from damage caused by water and water borne salts. Permanent bonding silanes have been routinely used across the globe for almost 50 years, as the best protective sealer for large concrete structures, particularly in salt water and de-icing salt environments. Silanes do, however, produce VOC emissions (alcohol) during the bonding process, so their use is being curtailed. California and Hong Kong are two places where use of silanes has been restricted with serious implications for the maintenance of large expensive concrete structures such as bridges, wharfs and highways. CONCRÈME™ is a new technology - the worlds only low VOC, permanent bonding silane which passes California's new world best practice VOC guideline. CONCRÈME™ is suitable for a wide variety of applications, including marine infrastructure (such as wharves and jetties), roads and rail bridge decks, building facades, car parks and swimming pool surrounds. It is an ideal product for the preservation of infrastructure. Very alkali resistant - won't breakdown in contact in high alkaline cement-based materials. A 15-YEAR PERFORMANCE WARRANTY is offered when CONCRÈME™ is applied by an Accredited Applicator following our written instructions and tested by us. One quart per 30 sq.ft. (1 litre per 3 sq.m.) depending on surface absorption and depth of impregnation required. Surfaces to be treated must be dry, clean and free of residues, and surface temperature between 40 - 95°F (5 - 35°C). Generously coat the surface with an even layer of CONCRÈME™ using a foam roller, brush, low pressure sprayer or similar. Estimated application rate: 1 Quart per 30 sq.ft. (1 Litre per 3 sq.m.) depending on surface absorption and depth of impregnation required. One coat is usually sufficient but a second coat may be applied at any time once the surface becomes touch dry. Use water to clean equipment. Sealer will NOT prevent surface etching, scuff marks or wear and may darken some surfaces temporarily, returning to the original color over time. On rough surfaces, globules of CONCRÈME™ may collect in gaps and pits. Use a paint brush to spread these out. For in-line manufacturing and large area applications CONCRÈME™ maybe applied using a hopper feed diaphragm airless spray unit. Do not take internally. Avoid contact with eyes and skin. Avoid inhaling vapours. Wear latex gloves and safety goggles during application. No smoking, keep away from naked lights or ignition sources. Keep container tightly sealed in a cool, well ventilated place. Use product before expiry date. If swallowed, drink a glass of water and contact a physician. If skin contact occurs, remove contaminated clothing and wash skin thoroughly. If irritation persists, contact a physician. If in eyes, hold open, flood with water for at least 15 minutes and contact a physician. If vapors are inhaled, relocate to fresh air. If symptoms persist, contact a physician. Spillage – Take up mechanically or with absorbent material such as sand, earth or vermiculite. Remove all ignition sources. Not regulated for transport of dangerous goods: DOT (Road), IMDG (Ocean), IATA (Air) Transport. VOC content to US EPA (Method 24, excluding water and exempt solvents) < 100 grams per litre - suitable for use throughout the USA. Fulfils the strictest LEED requirements. Compliant with EU VOC Directives 2004/42/CE and 1999/13/EC and Environmental Protection Department Hong Kong SAR Government 2007 Regulations. 2.5 gallon (9.46 Litre) easy to carry pail. MacKay Port Authority, QLD, Australia.